The new 50,000 sq ft Helen Plum Library building will replace the existing 32,000 sq ft building constructed in 1963 and expanded in 1977. 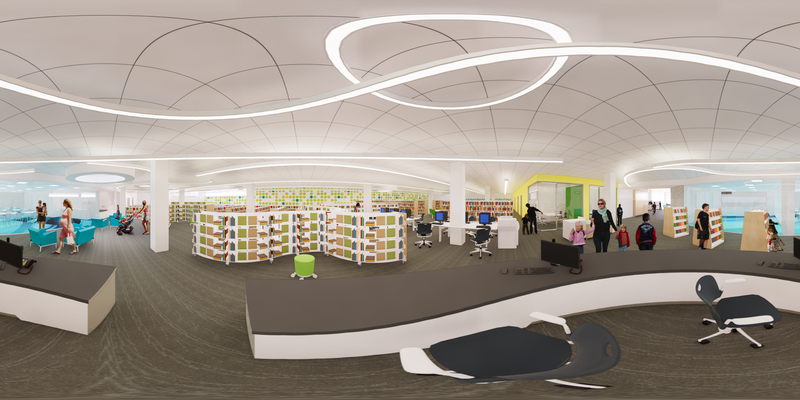 The new space will provide the Lombard community with a 21st century library that offers additional services, conveniences and a new public square. The existing Library building lacks any fire protection system and is not up to ADA standards. The new Library will be completely accessible and equipped with current fire safety protection. The December 2015 Helen Plum Library Facility Assessment recommended replacement of the Library’s two boilers—installed in 1968 and 1973, well beyond their useful life—and the entire HVAC system to prevent catastrophic system failures that could impact Library operation. The new Library will operate with a completely modernized heating and cooling system. Let’s Meet at Helen Plum! Ten study/meeting rooms will be available for one to twelve persons. A 28 person room in the West Pavilion can be converted from a board room to an audience style room for small programs and patron use. The large divisible auditorium on the first floor of the West Pavilion will include the latest audio visual technology and room for 100+ people. This space will have more reservable time for groups and programs since Youth Services will have their own storytime and craft rooms. Additional recommendations from the Facility Assessment required replacement of the leaking membrane on the exterior concrete plaza. An attractive multi-use outdoor plaza will offer a major enhancement and connection to Lilacia Park. 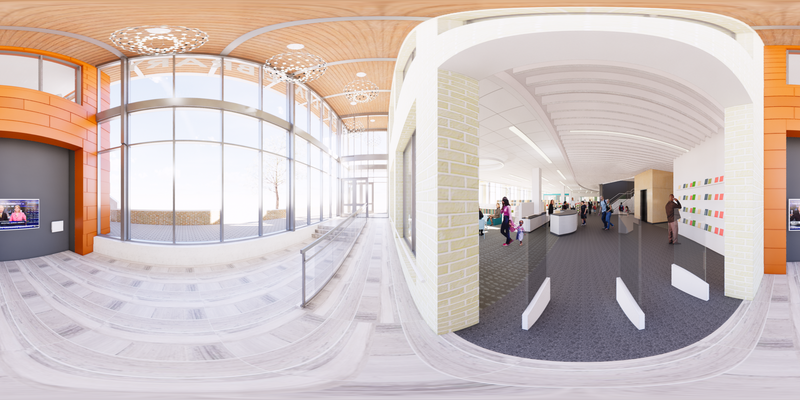 It features a direct entrance into the Library building’s second floor which leads to the stairs and elevator or directly into the Adult Services department. The outdoor space will have a variety of seating options and several areas for gatherings like book clubs, storytimes and other activities. Patrons will be able to use self-check service at that second floor exit to take their materials outside and conveniently enjoy the area when weather permits. The first floor building entrance will be much closer to the parking lot and 4 handicap parking spaces will be located directly in front of the building. Convenient drive-thru service is being added to the west side of the building to allow drop off and pick up of materials that have been placed on hold. Just inside the building entrance, a vending café area will be available with seating areas where visitors can plug in their devices. 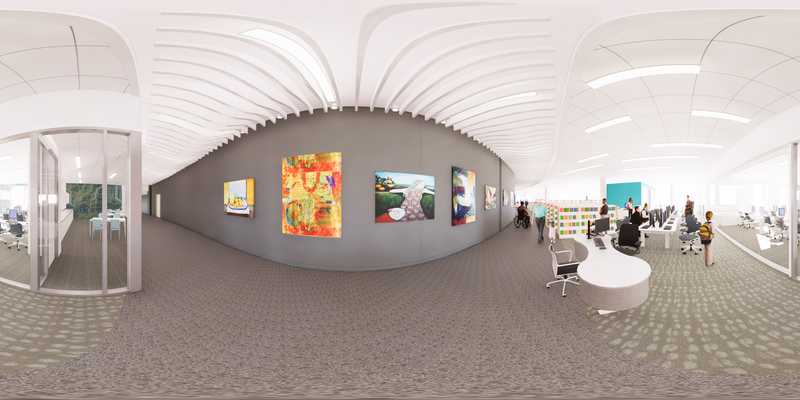 The Library hallway will provide wall space for exhibits and an art gallery. The new and popular materials located in the first floor area will be placed on moveable shelving to provide opportunities to convert the area into a place for special events. Technical difficulties with the virtual tour? See the still image here. An area specifically designed as a computer lab will be the new site for a much larger offering of technology training and programs. Additional public computers will be available on the second floor. 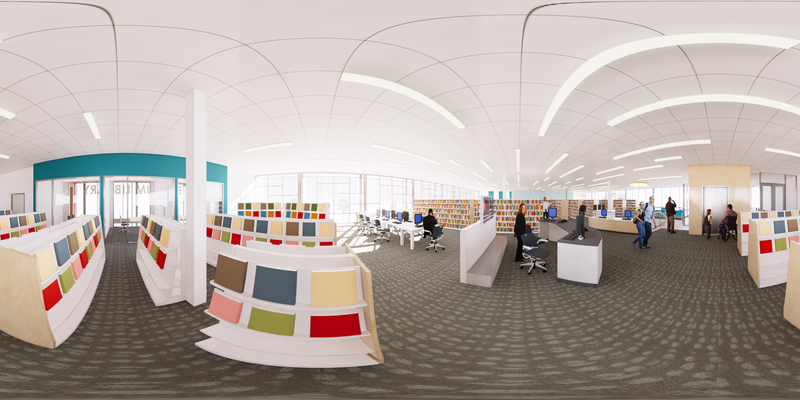 The Library will have a flexible space where patrons can create and learn using emerging technology, share community resources, and participate in hands-on creative-based activities and programs. 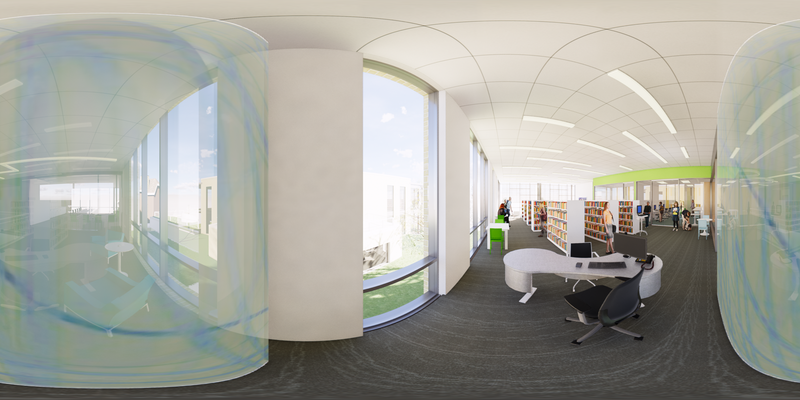 The majority of the Library’s adult collection will be located on the second floor in a quiet space surrounded by windows. This area will provide much easier access to the Library’s collections, as well as a large number of reading and working areas. Youth Services is expanding to include a storytime room, an activities space, a pre-teen area and an early literacy area. All of these spaces are easily accessed on the first floor. No more stroller parades on the elevator! Lombard’s teens will have use of a safe, supervised area for study, collaboration, and engaging in creative and technology activities designed with their input. The Young Adult collection will be adjacent to this space on the second floor of the West Pavilion. Both areas will have public computers available for kids and teens. The construction plan will take place in phases. The first phase will be to build the new West Pavilion in the current empty lot owned by the Library. Staff and about a third of the Library’s materials will be relocated into that space while the old building is demolished and rebuilt. Services offered in the interim library will be scaled back during this transition, which is expected to take approximately one year. Staff will continue to offer programs in various offsite locations in the community during this time. We will also expand home delivery and plan to implement parking lot pickup during inclement weather. Public computers and room for book clubs and storytimes will be available. The Library staff and Architects have completed the Design Development stage of the project and the budget estimate. Next steps include Planning Commission and Village Board meetings to review and approve the construction plans. Concept plans have been submitted to the Village and are currently being reviewed. Once the Village approves the plans, a construction timeline will be determined and shared on the Our Next Chapter blog. The new building project is expected to cost $23.8 million. The plan accommodates the budget escalations in materials and labor costs by constructing the project in phases, with the West Pavilion serving as the interim library. This alleviates the cost of renovating and leasing an off-site temporary space.